Review the latest and most accurate housing data for Bethesda, MD. According to figures released by the U.S. Census Bureau in 2010, the community had a total population of 60,858. Important institutions located in Bethesda include the National Institutes of Health campus, the Consumer Product Safety Commission, National Geospatial-Intelligence Agency and the Naval Surface Warfare Center Carderock Division. Bethesda is also home to Walter Reed National Military Medical Center (WRNMMC), formerly the National Naval Medical Center, also referred to as Bethesda Naval Hospital. Walter Reed National Military Medical Center (WRNMMC) is also the place where the President goes to get his yearly check-up. Adjoining the hospital to the east is the Uniformed Services University of the Health Sciences. In which, Bethesda is home to many of the U.S. Navy’s and U.S. Government’s Medical Care and Medical Research center(s). The headquarters of defense conglomerate Lockheed Martin, managed health care company Coventry Health Care and hotel and resort chains Marriott International and Host Hotels & Resorts, Inc. are located in Bethesda. Software company Bethesda Softworks were originally located in Bethesda, but moved to Rockville, Maryland, in 1990. The Discovery Channel also had its headquarters in Bethesda before relocating to Silver Spring in 2004. On the professional services side, numerous banks (PNC, Wachovia, Capital One Bank) brokerage firms (SmithBarney, Merrill Lynch, Charles Schwab, Fidelity) and law firms (Ballard Spahr, JDKatz, Paley Rothman, Lerch Early & Brewer) maintain offices in Bethesda. Bethesda has two farmers markets, the Montgomery Farm Woman’s Cooperative Market and the Bethesda Farmer’s Market. Federal Realty Investment Trust (FRIT) has developed much of the west side of downtown Bethesda into an area called Bethesda Row. 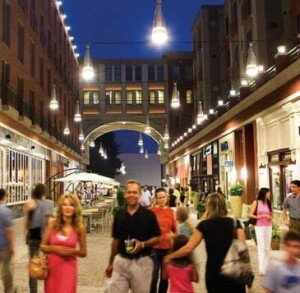 The vibrant district includes Barnes & Noble, an Apple Store, a cinema, and dozens of shops and restaurants. Also located in downtown Bethesda is one of the Madonna of the Trail monuments, erected by the National Old Trails Association working in concert with the Daughters of the American Revolution. Judge Harry S. Truman, presided over the dedication of the Bethesda monument, on April 19, 1929. Nearby is the Bethesda Post Office. Also starting in the heart of downtown Bethesda, is the Capital Crescent Trail which follows the old tracks of the B&O Railroad stretching from Georgetown, Washington, D.C., to Silver Spring, MD.